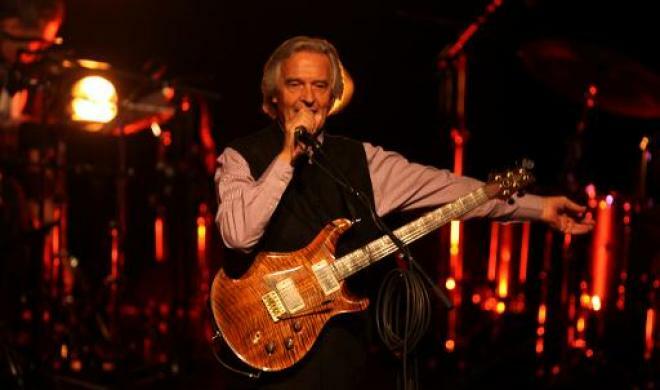 Palestine welcomes British jazz legend, John McLaughlin. The Palestinian territories are rarely a destination for jazz musicians let alone stars of an art form that is more at home in big cities such as New York and Chicago. Which makes the performance of jazz guitar legend John McLaughlin before a packed auditorium in the West Bank city of Ramallah on Wednesday night all the more remarkable. McLaughlin toured areas of the West Bank before enthralling the mostly local audience who attended his “solidarity concert” for Palestinians with a fusion of Western and Eastern sounds. The 72-year-old British musician, who has recorded with the likes of late jazz trumpeter Miles Davis, said proceeds from the concert would go to a local NGO. “People here are isolated… and the situation is such that since very few people can leave, it’s important that people from the outside come in,” he told AFP. Palestinians “don’t have freedom, they don’t even have passports… it’s lamentable that an entire people are in such a situation. So I feel it incumbent upon myself to make other people aware of it,” McLaughlin said. The concert was the second that McLaughlin has performed in Ramallah after an appearance in 2012 in support of Al Mada, a charity which uses music therapy to help traumatised and marginalised Palestinians. “I am personally aware of how marvellous the power of music is. It has fantastic healing qualities,” McLaughlin said. “We’re not making some gigantic contribution like building a dam or a reservoir, we’re just playing music. But music to me is… very powerful,” he told local reporters on Tuesday. Wednesday’s concert, which featured a heavy influence of Indian music for which McLaughlin is known, enraptured those who attended. “It was excellent, I love jazz and there’s not much live jazz here,” said Ramallah resident Nabil Turjman. “It’s wonderful that someone this well-known comes from so far, it shows great support for and solidarity with Palestinians,” said Turjman’s wife, Rana. McLaughlin, who arrived Tuesday from India on the final leg of his Asia tour, also sat in on Al Mada therapy sessions. Al Mada, which seeks to encourage both adults and children to open up about traumatic experiences through music, was received with suspicion when founded in 2009, according to its co-director Rim Abdel Hadi. “At the beginning it was a bit challenging,” Abdel Hadi said. Many Palestinians “found it a weird concept, as music is (thought of) as being a luxurious activity and limited only to those who can afford it,” she said. But since the organisation started, the concept has gained ground and is supported and funded by various international agencies including the UN’s Palestinian refugee agency UNRWA. Even in an environment where there is so much need for physical development, the psychological effects of art therapy are just as essential, she insists. → Female genital mutilation: Not in religion’s name, not in our name! ← The coziness of Dar bistro & books (Beirut, Lebanon).